"He wrote me this letter from Australia," explains Brian, "and said that the pinnacle of his life would be to make a proper copy of the Old Lady, as he didn't believe that it had ever been done before. I talked to him and he flew himself over, I let him go over the guitar to the ultimate millionth of an inch; he went home again and 18 months later arrived with three superb copies of the guitar. They're just beautiful. If I'd gone looking for someone who could do this, it would have taken years to find him." Brian doesn't disparage the various models built for him by Guild, but confesses that there's something very different about Fryer's approach. "Guild made a great job, but they couldn't get into every single detail of say, the tremolo or the woods for a production guitar. Greg did it all by hand, exactly the way I'd done it. And he'd researched all the materials, the finish, the glues, everything." Once Brian had seen the sheer quality of Greg's work, he trusted him enough to let him examine the guitar he'd made all those years ago with his father. The guitar was irreplaceable, but it was in trouble. "It's surface had become so pitted that it was unable to keep out the elements," adds Brian; "remember it's got to go from minus 30 degrees to tropical temperatures." Initially, Greg was just a little over-awed by the thought of taking apart one of the world's most famous, not to say priceless, guitars. So Brian took the plunge himself. "I got the screwdriver out and we took it to bits. After that, Greg took over. He's great, because he never does anything without asking, and never without researching what I'd done in the first place. I have to say that I found it interesting, revisiting what we'd done. It was all by hand: we made little jigs to shape things like the frets and the bridge. Greg's very interested in the design of the guitar and the fact that, when we did a lot of those things, it was the first time they had ever been done. I just hope it'll all go back together again!" Brian is only too aware that his renovation of the Old Lady will cause raised eyebrows in certain quarters, due to its vintage value and scarcity. But this is a working guitar first and foremost, and it was beginning to fall to pieces, literally. "Oh yeah," sighs May, "I know some people will disagree with what I've done, because there's this big fetish with old guitars, where you can see all the wear on them. "I did some real soul searching. Take the fingerboard: we were going to repair the pits caused by damage, but keep the wear. 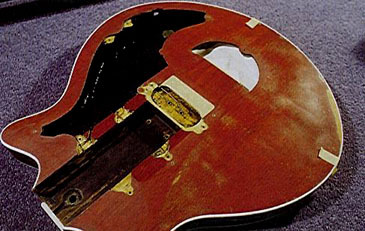 Then I decided it should be restored; it's still going to be my main guitar and it's going to get worn again." Brian then slipped away for his interview with Simon Bradley, while I went to meet Greg. Head bowed over the Old Lady's dismembered limbs, Greg put me in mind of a surgeon, grafting back the pieces of some hapless road accident victim. This comparison may seem a distressing one but the similarities are remarkable: absolute love of the job is paramount, total care and dedication vital; attention to detail also imperative. This guy is a complete perfectionist. Unusually quietly spoken for a Sydney lad, Greg was nevertheless quick to show his disapproval as my fingers wandered over the guitar's dislocated body. "Please... don't touch... that's been degreased about 15 times already. Now I'll have to do it again." Oops! But soon we are getting along well, Greg becoming animated at the thought of telling Guitarist readers about the builder-repairer's dream come true. "It's a huge privilege," he begins, "because, like loads of other guitar makers and players, I've been a huge fan of Brian's playing for a long time and it's fantastic to be associated with the research and development on his guitar." When Greg first came to England in July 1996, he discussed the repairs Brian was envisaging at that stage. "They were just cosmetic things, such as the binding, which had been coming off at the top side and had been held on with bits of tape for about seven or eight years. And the machineheads had been replaced a few times. He wasn't happy with the Gotoh locking heads and there were holes in the back of the headstock, filled with bits of wood. I'm replacing the machineheads with Schallers, the same type which are one my own guitars, where I've adapted the Gotoh white pearl buttons, identical to Brian's originals." Once May was confident in Greg's abilities, they took the project several stages further. 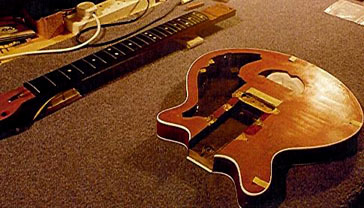 "We took the neck out of the body and removed the tremolo, and the whole process evolved as we've gathered up our courage. Initially, no re-finishing was talked about, but Brian eventually decided that he'd prefer to have some re-lacquering done, just to stop the bits that were really falling apart from deteriorating further. So all the usual discussions that go on between guitar collectors and players come up; like whether to leave it in its original, semi-battered form. Ultimately, Brian was the one who had to be happy with the course that we took. He's the one who plays it, and it is a playing instrument; it'll never be sold, so it doesn't have any intrinsic value..."
Repairs to the body include several pieces of veneer that were scarfed in. "These are bits that have been torn away or worn out by belt buckles. There are other areas, like the little dip up near the scratchplate, where the sixpence 'plectrum' had chopped up the wood. There are two large sections where we've done trials with Rustin's Plastic Coating, and different methods of preparing the surface to get the grime and some of the wear and tear out. At least what goes over the top now will hold together, so that whatever might be underneath stays reasonably invisible." Remarkably, perhaps, the Old Lady was in incredibly good structural shape, considering all the wear and tear that it's faced over the years and the occasional accidents that have befallen it. The lacquer checking on the guitar's top, however, does look quite serious. "That's mainly from movement in the surface veneers," Greg reassures me, "but the glue has held together pretty well. It was Cascamite, a urea-formaldehyde glue which evolved through the 1940s and 1950s; it's still used in some boating applications. It makes quite invisible joins, too. But you can see where the screws that hold the layer of blockboard together are, because they're the things that have moved. The veneer has started to split, but most of it's just the Rustin's, which has reached the end of its elastic life and cracked where the veneers have started to move." As a builder of extremely high quality guitars himself, what does Greg think of the workmanship here? "It's remarkable," he exclaims with genuine respect. "It was much more difficult for them to do that job than, say, for me to build my first guitar in 1980, because a lot of things just weren't available. Now, of course, I can get all the stuff from the States and it's on my doorstep in five days. But Brian and his dad did it all the hard way. They were re-designing the wheel and in some ways making a better version of it than any of the guitar companies." What about the idiosyncrasies that father and son built into the guitar? "There's the very thick neck, for one. The next thing that people notice is the wide spacing at the nut and the comparatively narrower spacing at the body end. Apart from those things which they deliberately chose to do, it's made in a very sound fashion indeed. "They chose the correct materials and they've done some things that were really hard to do. Putting the veneer round the sides is very hard, because it never wants to stay flat. They did all these jobs very well, and they were only using hand tools in a top room of the house. "The whole concept was extremely innovative," say Fryer, "because they were going from a clean-sheet design and they put their minds to things that confound guitar-makers time and again. Their tremolo system and their bridge with the rollers were very original and worked extremely well. And the headstock is incredibly well designed, with almost straight string pull and very shallow angles across the nut; just enough to pull the strings down and not to add to the tuning woes. "Strats have much more trouble with their varying angles, from the bottom E to the top E, and the Stratocaster is arguably the best guitar ever designed." As Brian has said, this guitar has to withstand vast temperature and humidity changes throughout its life. So how has the neck stood up to the rigours of the road? "It's as straight as an arrow," exclaims Fryer. 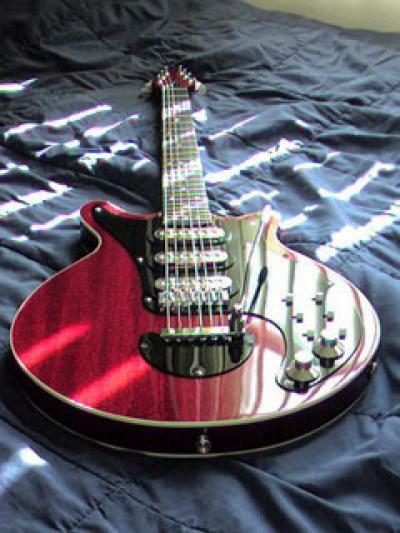 "The truss rod has never been adjusted and I undid the nut with my fingers. It's still true and straight on both sides and in the middle. It's a great piece of work." Those who've followed the life of the Old Lady will know that various wiring changes have been carried out over the years; gain boosters fitted and removed and feedback addressed. What's the instrument's current electrical state? "Over the last couple of years, I've done a lot of development work on the pickups I've used in my own guitars, which are Kent Armstrong's latest editions of Burns Tri-sonics. But I've changed them to my own specifications and worked out ways to decrease the microphonic squeal, which is always a problem on pickups with a metal cover and metal base. 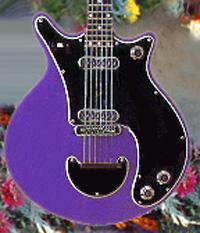 So, based on my developments there, Brian suggested it would be worthwhile to see what I could do with his pickups. So I've taken them all apart and done some work on them; nothing has been changed in the coil, of course. Two of them were potted in Araldite, but I've done things which should improve the microphonic squeal. So, hopefully, they should sound the same but just have a better tolerance to feedback at high levels. "I'm going to be shielding the internal cavities too. I've cleaned up all the electrics; there were shreds of sixpence over everything; there was all this green stuff and it was bits of sixpence that had been chopped away as gritty little bits; the jack socket was full of that. There were several wires that were hanging on by a thread, so some of those joints have been re-done. "In my guitars I use an adhesive backed copper foil and, because they're very quiet, Brian thought it'd be nice to do the same. There's been a bit of work on the scratchplate as well. I've got to glue a little piece down near the bridge pickup, which had been broken for a long time, and fill different holes; one in particular, where the fuzz box used to be. The shafts of the volume and tone controls had quite a bit of movement too, especially the volume, so those have been re-centred and re-drilled, so now, there's only the smallest movement. It's all coming together really well and I'm expecting to finish the job in a week or so." This incredible project has kept Greg Fryer occupied since early January of this year. Brian May's beloved Old Lady is now back in tip-top condition after a spell of love and care that even BUPA would be more than proud of. "It's been an incredible three-and-a-half months," says Greg. "It's been very in-depth and taken a huge amount of research, down to finding out the exact properties of the materials we're dealing with. "In every area, we've got in touch with experts in the field and done loads of experiments to make sure that all of these procedures were going to work out properly. "We haven't just ploughed straight in. The preparation has taken two or three times the length of the end process because with this guitar, everything had to be exactly right. And when I say that, I mean it's got to be sorted first time round!" Although Greg's involvement with the guitar is now over, he's certain to be called on for further servicing and general upkeep of the Old Lady. 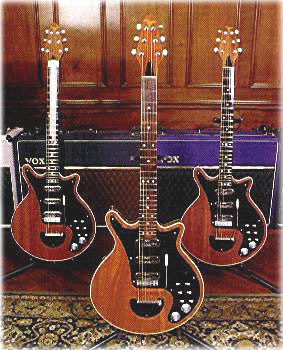 In the meantime, Brian May is in heaven, as he's using possibly the best back-up guitars he's ever owned; these are three instruments built by Fryer to exacting specifications. Know as 'John', 'Paul' and 'George Burns' respectively (that last play on words, of course, referring to Beatle George Harrison, Burns pickups and the wry old American Comic), these guitars are nothing short of stunning. We know because we've played them.